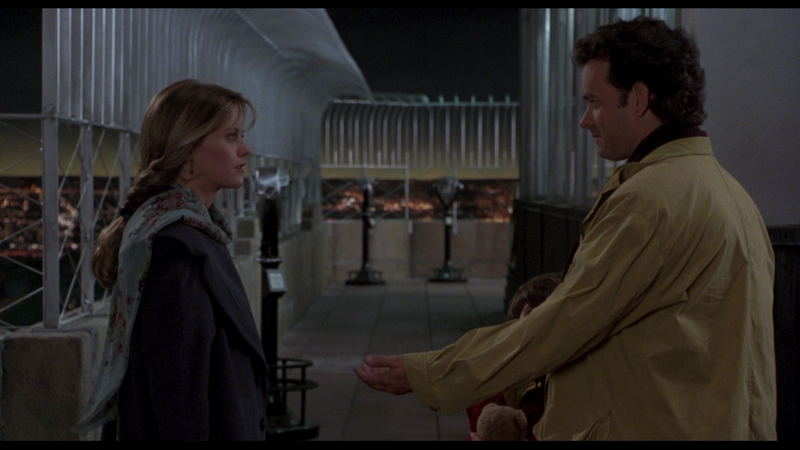 Nora Ephron’s romantic drama/comedy Sleepless in Seattle isn’t the smartest in the genre but it does pay homage to the great romantic films of yesteryear and takes some superficial jabs at them in the process. But what makes Sleepless so timeless and respectable what the fact we don’t even see our two leads together until the final reel. 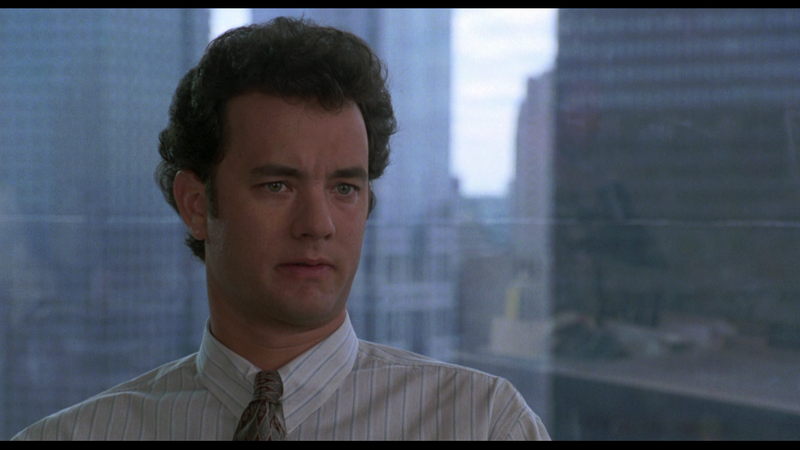 Sleepless in Seattle solemnly opens with Sam Baldwin (TOM HANKS) and son Jonah (ROSS MALINGER) attending a funeral at a cemetery with a director’s dream scenic view of the Chicago skyline. In the need for a change in scenery, Sam and Jonah move out West to Seattle in an attempt to start a new life and memories. 18 months later, in Baltimore on Christmas Eve, we meet Annie Reed (MEG RYAN) and Walter (BILL PULLMAN) who have announced their engagement to Annie’s family. We quickly learn that Walter is a nice fellow but quite boring and, I think only happens in movies, is allergic to every single thing known to man. It’s equally obvious her engagement is the safe option after not getting the same spark of magic that her parents had when they first met. On her way to Walter’s family home, taking separate cars, flipping through the radio dial, Annie comes upon a call-in program where Dr. Fieldstone takes calls from various people looking to solve their issues via the faceless entity sitting behind a microphone. One caller happens to be young Jonah, concerned that his father is sad and that he needs a new wife and Jonah in turns needs a mother. Eventually coaxing old dad on the phone, Sam is initially resistant but quickly opens up about his deceased wife and the fact he cannot sleep, thus getting the nickname, Sleepless in Seattle. Now Annie, along with thousands of women across the country, is engrossed on Sam’s story. The Baldwin’s receive bags full of letters from, mostly, desperate women willing to go so far as to move but Sam is old fashioned and, thanks to the push by his son, gets back into the dating game calling a former client with, of course, an obnoxious laugh. However, Jonah is fixated on a letter written by Annie, and sent by her best friend (ROSIE O’DONNELL), and pushes the letter onto his dad to the point of obnoxiousness. And back in Baltimore, Annie continues to struggle with the choice of a safe life with the perfectly suitable Walter or the soulfully drama with Sam. She even goes so far as hiring a private investigator to follow Sam and eventually goes to Seattle where the pair share a brief glance across a freeway. 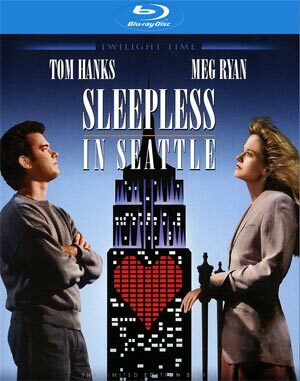 Sleepless in Seattle hardly breaks new ground in the romantic-comedy genre but thanks to Tom Hanks and Meg Ryan, despite being a part for 99% of the movie, have incredible chemistry helped no doubt by their first pairing in Joe Versus the Volcano and furthered 5 years later with You’ve Got Mail. The late Nora Ephron really had a gem here which for me has stood the test of time. No, it’s not a perfect movie with some of the character actions really perplexing starting with Jonah who is a budding sociopath and probably is leading a life of crime now in his late 20s. Even so, I found the film to be thoroughly enjoyable even after seeing it numerous times over the years. The screenplay is well written and for her part Ephron is able to keep the pace going until the leads finally meet at the end. Most of the features from the special edition DVD have been ported over except from some useless production notes and such. Inside is a 6-page booklet with an essay. Audio Commentary – Co-Writer Nora Ephron and Associate Producer Delia Ephron sit down for a low-key but informative track discussing various aspects of the screenplay, working with the actors, and shooting in different locations. The track is accessible in the “Set Up” submenu. Sleepless in Seattle: Love in the Movies (13:09) is an old featurette discussing romance in film from the perspective of the cast and crew and those in the field including Dr. Drew and Adam Carolla. 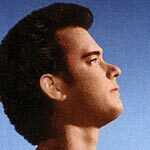 Also included is the Music Video (4:22) “When I Fall in Love” as sung by Celine Dion and Clive Griffin, the Original Theatrical Trailer (2:32) and an Isolated Score Track. 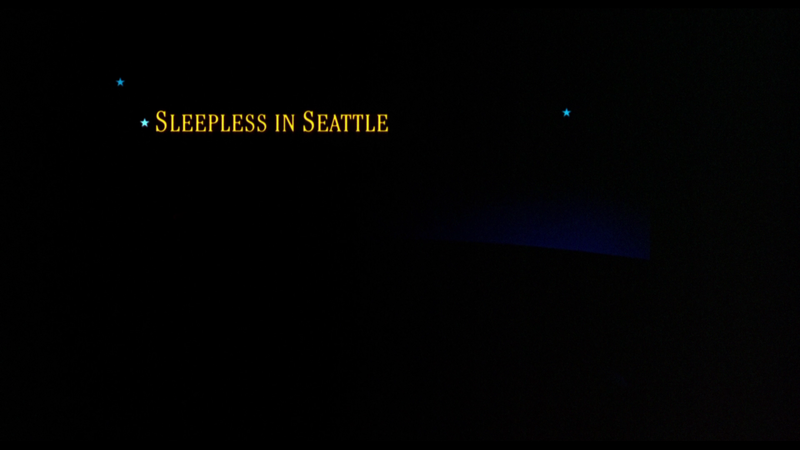 Sleepless in Seattle debuts on Blu-ray thanks to independent distributor, Twilight Time. The movie is presented in its original 1.85 theatrical aspect ratio and although it does look better compared to its DVD counterpart, I don’t think this is a transfer which will wow people. The detail levels in most scenes are passable but there is a fair amount of noise which tends to be large and the color array seems a bit muted. All that being said, the DVD is nothing to look at and for all the problems I have with this HD transfer, it is an above average improvement. At first I was excited to see this would be getting an upgrade from a standard Dolby Digital 2.0 track to a lossless 5.1 channel DTS-HD MA one… unfortunately, while it does sometimes sound really good (during the music mostly), the rest is kind of disappointing. Dialogue volume seems soft and relegated to the center channel, ambient noises aren’t overly noticeable and the all around quality is so-so. However, given the movie is 20 years old and I can’t think the sound mixing was great to begin with, and considering the genre, I can’t lay too much fault as it’s at least passable. 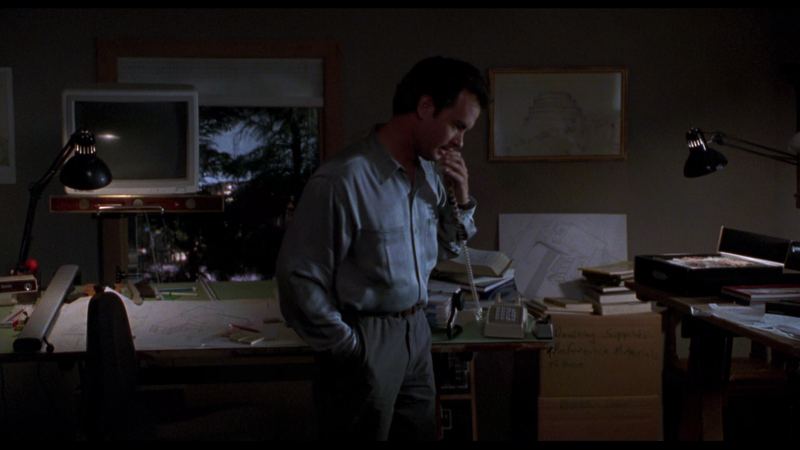 Overall, Sleepless in Seattle isn’t the perfect romantic-comedies but it’s an effective one and respectable given the two leads share very little time on-screen with one another. Tom Hanks and Meg Ryan are great in their respective parts separated and even though I’ve seen the film dozens of times over the years, it’s still entertaining. The Blu-ray distributed by Twilight Time isn’t the best but certainly a good enough upgrade over the original DVD released back in 1999. Yes, the price is steep but if you’re a fan and don’t buy or upgrade Blu-rays too often, it might be worth the one-time cost.